Set of 4 Heavy Duty Swivel Casters w/ 5" x 2" Phenolic Warehouse Wheel. 5" Diameter x 2" Wide. Tool Box Kingpinless Caster Set. 4" x 4-1/2" Plate with 3/8 Bolt Holes. 4"x4.5" Outside 2-5/8" to 3"x3" to 3-5/8" Holes. (4)(2)65DUR-520-S4(2)46DUR-520-R. 4" x 4-1/2" Plate / Holes: 2-5/8"x3-5/8" to 3"x3". HEAVY DUTY CASTER ANATOMY KEY. Mounting Plate and Kingpin - A flat plate with an Integral Kingpin. Load Bearing (Commercial) - Row of steel balls or rollers that allow the yoke base to swivel. Yoke Assembly - The yoke base with legs welded on and machined for the Main Load Bearings. Axle Bolt - The bolt on which the wheel revolves. Axle Bolt Nut - Secures the axle bolt to the yoke assembly to form the axle. Thrust Bearing - The row of bearings that operate between the yoke base and the retaining washer. Retaining Washer - Keeps the bearings retained. Kingpin Nut - Holds the swivel section together. ner Bushing - A tube thats between the legs, over the axle, on which the roller bearing rides. A caster represents the complete assembly of one wheel, wheel bearings, yoke, axle, and nut, and optional: thread guards, brakes, swivel locks, springs... , all of which are assembled together as one complete unit. There are two basic types of casters. SWIVEL CASTER (aka CRAZY WHEEL CASTER). Consists of all of the components of the caster as well as a raceway which contains balls or bearings that allow the caster to swivel. RIGID CASTER (aka FIXED WHEEL CASTER). Or stationary caster, or fixed casters consists of all of the components of the caster but does not have a raceway. (It therefore can roll only in two directions, in a straight line). Distance measured horizontally from the center of the step or top plate to the trailing edge of the wheel. This the distance around which the caster will travel while swiveling and the amount of space needed from the center of the wheel to any obstacles. Width of wheel at the point of contact with the floor. This is not usually the widest point of the wheel or the narrowest point. The widest point is usually on the sidewall and the narrowest is usually at the hub or very center of the wheel. Bearingners are usually inserted to increase the center width of the center of the wheel and decrease the inside diameter of the wheel. For example if you ask about a 6" caster, we assume you are talking about a 6" wheel even thought the caster overall height will be 7" to 7-1/2". Vertical distance from the floor to the top of the mounting plate or the top of the swivel raceway for a stem caster. The working load height of the final item. If the caster has a stem, the overall height does not include the height of the stem. Stops (or slows) the wheel by applying pressure from the side between the wheel and the forks. Not the most positive type brake, but relatively cheap and works in many applications. Bake petal is normally on the side of the caster, but sometimes on the top below the plate or stem mount. Very positive braking action, but cost more than other types of brakes. With the wheel and the swivel locked down, the caster becomes a foot with no movement side to side or around. SWIVEL LOCK OR DIRECTION LOCK BRAKE. Usually has a pin that pulls out and when inserted back into the swivel section, prevents the caster from swiveling. This turns a swivel caster into a rigid caster. Normally has 4 positions to lock the swivel at 90 degree offsets. Very useful for some applications and can be combined on some casters with a top lock brake. Also called a "Position Swivel Lock" at times. Another name used for both Friction Lock and Top Lock Brakes when the brake petal is on the side of the caster. Usually refers to a brake that activated from the side and locks only the wheel from the top. The caster kingpin is the pin in the center of a plate caster that holds the plate to the wheel forks. On a stem caster, the radius is from the trailing edge of the wheel to the center of the mounting stem. The bearing in a swivel caster is located above the wheel at the center of the plate or stem mounting cap. The bearing in a wheel is at the very center of the wheel and can be one of many types. Ball Bearing: uses balls inserted into a housing that allows freedom of movement and usually includes one bearing in the center of two with one located at each side of the wheel, Anular Bearing: uses balls like a ball bearing but has a single piece thats the entire width of the wheel to create a complete solid point of contact for the axle, Delrin Bearing: Nylon or solid poly self lubricating insert that is usually white and acts as a simple and cost effective way to allow freedom of movement without requiring any grease or oil and has no moving parts. The distance from one side to the other side of the wheel at the very center without the bearing installed. Is almost always different that the width of the wheel. There are many styles and sizes of stems. Plate casters have a small plate with 2, 3, 4 or 6 holes for mounting. Threaded stem casters use nuts and come in several sizes and threading styles. Grip stem casters have solid posts of varying sizes and have a flexible ring to hold the caster in place. Friction stem casters come in a variety of sizes and simply slide into place and use the weight of the chair to keep them in place. 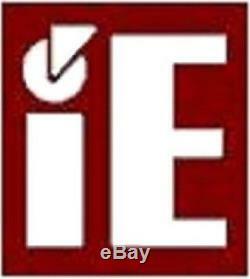 The listed capacity is the total for all casters included in the listing. If the listing is for just one caster the total capacity listed is per caster. If the listing is for a set of four casters the listed capacity is for the set of four casters. Capacity is the total weight the casters can hold in a static mode. That means the capacity is based on a steady, non-moving, impact free, long-term use. What do the measurements mean? DIAMETER: This measurement is always about the size of the wheel only. It represents the height or diameter of the wheel from the ground to the top of the wheel only. It is not the measurement of the rig or any other part of the caster. The wheel diameter is precise, however because of the elasticity of rubber there is a variance of up to 1/16 on some wheels. STEM OR PLATE SIZE: This measurement is the mounting mechanism of the caster. This is always the very top part of the rig. If it is a plate caster the size is outside to outside on each side. Since opposite sides are always equal this measurement is provided in 2 sizes i. 4" x 4-1/2" which means two sides are 4" and two sides are 4-1/2" This measurement does not reflect the bolt hole mounting requirements. 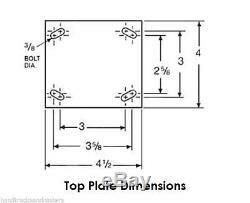 See bolt hole dimensions for that size. If it is a stem caster the size is diameter or width of the stem and then the overall height of the stem. The type of threading on a "nut and bolt" style or "threaded stem" is indicated in threads per inch or as UNC which is standard coarse thread or FINE which is tight threading. These are precise measurements within industry standards for all nut and bolt hardware. HUB WIDTH: Distance measured at the very center of the wheel. This size is always larger that the wheel or tread width to prevent the wheel from rubbing against the sidewall of the rig. TREAD WIDTH: Width of wheel at the point of contact with the floor. This is not the widest point of the wheel or the narrowest point. This measurement is NEVER exact and is almost always smaller than stated. The reason for this is that a rig designed to accept a 1-1/4" wide wheel will be designed for that measurement at the very center and if the wheel is also 1-1/4" wide at the point of contact with the floor it would rub against the sidewall of the rig and fail to roll. Tread width is always narrower than stated to allow the wheel to roll. This is the industry standard for this measurement. CASTER SIZE: Determined by wheel diameter. For example, if you ask about a 6" caster, we assume you are talking about a 6" wheel even though the caster overall height will be 7" to 7-1/2". So, when you start to search for a caster be aware that a caster listed as 6" x 2" is specifically talking about the size of the wheel and the 2 measurement is for the center of the wheel not the edge of the wheel. OVERALL HEIGHT: Vertical distance from the floor to the top of the mounting plate or the top of the swivel raceway for a stem caster. ID or BEARING SIZE: This measurement is the inner diameter of the wheel and is not precise. In fact, the size listed is the size of the bolt required that will go through the center of the wheel. The ID or bearing size is slightly larger than the bolt to allow the bolt to easily insert into the wheel and create a low-friction environment for the wheel to turn. The ID listed is normally 1/32 smaller than the actual hole size. Hand Trucks and Casters, Inc. Capacity is total for listed quantity. B& P Made in the U. Wesco Aluminum and Steel Hand Trucks and Utility Carts. Wood and Aluminum Platform Trucks. Casters and Wheels Parts and Service. Warehouse and Storefront in Kansas City Open 9 to 4 Monday thru Friday. This is not common, but it happens. If an item is received in an obviously damaged package or box, please indicate that when signing for the item. Tracking is not always available. Economy (Slow) or Priority (Faster). 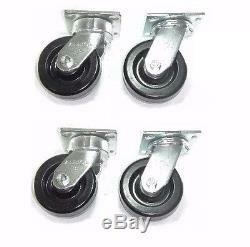 The item "Set of 4 Heavy Duty Swivel Casters with 5 x 2 Phenolic Warehouse Wheel" is in sale since Thursday, September 22, 2016. This item is in the category "Business & Industrial\MRO & Industrial Supply\Material Handling\Casters & Wheels". The seller is "handtrucksandcasters" and is located in Kansas City, Missouri.